Kneeling at the altar where one day their children would be served tater tots. A big cafeteria. That’s what you need if you’re planning on running an institution that teaches children from first through eighth grade. St. Gerard, my elementary and middle school alma mater, met that requirement with room to spare. As a little kid, our cafeteria seemed like a cavernous space, an immense and spare rectangular room so large that its flat and featureless ceiling was supported by more than half a dozen pillars. If the prospect of attending a school that included students twice your height and age didn’t already make you feel small, being herded into the cafeteria for the first time erased any vestiges of pride. For a hall that admitted plenty of sun through great windows along its length, the St. Gerard cafeteria was run with chilling efficiency. To this day, if I were to walk through its far entrance, I could show you the exact path that we were expected to follow as we wound along the perimeter in single file toward the serving area. There we would pick up the molded plastic trays upon which a small group of cafeteria ladies – some nice, others indifferent, and a few downright intimidating – would deposit the various components of the day’s meal. We picked up our milk last, dutifully inserting the half-pint carton into its designated tray compartment, and proceeded toward the seating area. That was where they assigned their sternest and stoutest personnel, I believe, no-nonsense disciplinarians whose directives would be followed without question. It was they who marshaled us down the farthest seating row until it was filled to capacity, then subsequent rows would be seated in like fashion. Due to this system, you always knew who would be sitting immediately to your left and right, but there was no telling who would be sitting across from you. Consequently, students tried to manipulate their place in the lunch line to ensure proximity to at least one friend, or else it could be a conversationally awkward lunch. If things turned out badly, you might even find yourself sitting opposite strange kids from the grade above you. There was one day during one of my earliest years at St. Gerard when, through no fault of my own, I was detained at the beginning of the lunch period, thus preventing me from lining up with my peers. To my horror, I arrived at the cafeteria as the eighth graders were approaching the serving windows, leaving me no choice but to meekly take a spot at the end of their queue. The seating area matron ensured that I followed the conventional arrangement, and I spent that lunch staring down at my tray and wondering if the eighth graders were laughing at me, or maybe they always laughed at everything. I recall being a fairly happy kid when I was very young, but somewhere along the line I endured a brief period of socially crippling neuroses that may have had their genesis in the St. Gerard cafeteria. To the adults in my life, it seemed absurd that I should worry about “getting in the wrong lunch line” at school, but the specter of total ostracism was a real and reasonable fear to me. Soon my paranoia was manifesting itself in truly irrational ways, leading me to such bizarre suspicions as the idea that my own breathing might not be involuntary, and if my respiration really did depend on a certain degree of consciousness, I might expire in my sleep on any given night. It was a challenging time for my poor parents. Crazy or not, I was responding to an atmosphere that certainly had its oppressive qualities. For example, there was a total segregation of students who packed their lunches from those who purchased a school lunch. Why, I have no idea, except that to do otherwise might have thrown a wrench into the precision mechanism of the rigidly enforced seating system. Packers sat at a totally separate set of tables, and because they were only a small minority of the student body, there was a measure of pathos in their lonely uncrumpling of lunch bags. I felt sorry for them. I eventually befriended one of the packers in fifth grade, and though we became good friends outside of the cafeteria, we were destined to never share a lunch conversation. Teachers and other adults who work with children, remember to err on the side of caution when you suspect impertinence from your charges. A quick and kind explanation of why my request had to be denied would have sufficed, but the grizzled hag whom I addressed eyed me with the outrage of Dickens’ Mr. Bumble regarding Oliver Twist begging for more gruel. “Oh no you won’t!” she snapped, and my cheeks flushed with shame. Taking a cold seat at my assigned row, I silently vowed to never again phrase a request in such a presumptive manner. Even if every adult who staffed the cafeteria had been as gentle and caring as Mr. Rogers, any kid can tell you that the greatest threat to one’s well-being exists in the unpredictable actions of other kids. Stan Smithers put me off white milk for at least a year when he inexplicably picked his nose and deposited a morsel of snot into my open half-pint. I remember that he did this gleefully and without the slightest duplicity. He seemed to deeply enjoy the look of sheer revulsion and anger that I must have assumed upon witnessing his transgression. It took me a long time to get over it. Every time I raised a glass of milk to my lips, I couldn’t help imagining a gooey, green glob floating invisibly within it. Remarkably, I ate eight years worth of lunches in the St. Gerard cafeteria without ever knowing the profound personal significance of my surroundings. The space looked sterile and utilitarian at best to me, with one particularly garish wall upon which was mounted an electronic BINGO board. 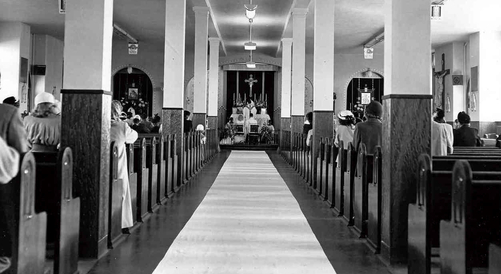 I was totally ignorant of the fact that our lunch tables rested where rows of pews were once bolted to the floor, that our trays were filled where an altar once stood, and that decades before we wolfed down tater tots, my parents had walked down an aisle between the pillars as a newly wedded couple. How was I to know that my home rooms through fifth grade were situated above and below the modest sanctuary where Mom and Dad were married? It never occurred to me that the building I knew as the church was not yet built when they attended St. Gerard. I never found out about this fundamental piece of my own history until many years later. I wonder if it would have made a difference had I known the former sanctity of the space we called our cafeteria. Maybe it would have made that day with the eighth graders a little less scary. Perhaps I would have shrugged off the tart reprimand of Mrs. Bumble. And if only I had known that Stan Smithers was putting his snot in my milk in the very room where my parents had exchanged vows, I might have given the kid what he deserved. That’s right, Stan. I know you’re out there, and I haven’t forgotten. You might want to keep an eye on your milk.